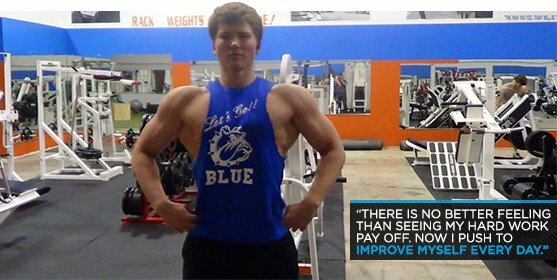 Body Transformation: Teen Raises The Standard! Alex described himself as 'puny' and 'weak' before bodybuilding became his forte. He's shredded to the bone and busting at the seams after building 50 pounds of muscle! I was always considered small, puny, and weak. 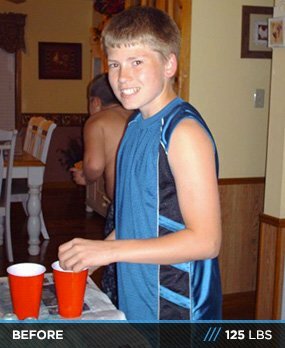 When I attempted football, basketball, and track, I was at a disadvantage compared to others. My bench press was at a gigantic 95 pounds and my athletic ability (speed and quickness) wasn't up to par to be successful. My father tried to help and informed me on certain steps to take to achieve my desires, but I was stubborn and didn't want advice from anyone. I was trying to be "independent" and didn't want help. I tried desperately to resolve my disadvantages. Like most rookies, I wanted to take "supplements" instead of applying proper nutrition and training and didn't see any muscle gains. After failing countless times, I listened to my dad. Through trial and error and good information, I saw results and enjoyed the gym more as I progressed on my journey. During this time, I realized the only reason I wanted to do well in sports was to impress others. I never enjoyed sports; it was just what everyone did at the time. 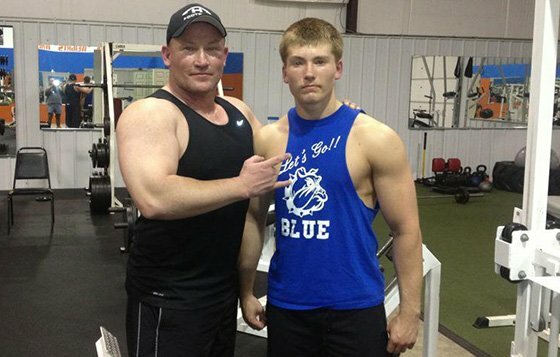 When my dad brought proper lifting and nutrition into my life, I found a new passion. There is no better feeling than seeing my hard work pay off. Now I push to improve myself every day. Staying consistent and optimistic is the best way to be successful. At first, I didn't feel the need for help, but learning from others was the best advice/information I ever got. Always keep learning and stay open minded to all aspects of fitness and nutrition. Set goals and keep progressing. Never live your life to the standards of others and always believe in yourself. To gain muscle and lose fat, I keep my protein intake the same as my bodyweight. Keep fats moderate to high and keep carbs high. I'm a big believer in heavy, but smart lifting. Warm-up reps are very important to prevent injury. I perform 1-2 warm-up sets before every working set. Most lifts are 3-5 sets. First sets are usually 6-12 reps, but the last set of almost every exercise is to failure. Rest periods are 1-2 minutes. Staying consistent and converting fitness to a lifestyle rather than a hobby was the most difficult aspect. Every day comes with new struggles and obstacle that you must be willing to overcome. A strong mind is important to obtain your ideal physique. You have to picture yourself how you want to look in the future. While you lift, imagine trying to mold/shape your body as you envision in your mind. Currently, I'm dieting for two natural bodybuilding competitions in June. I hope to earn my natural pro card in 3-5 years and help others around the world achieve their fitness desires. Never let others run your life. Take charge of your life and make it happen. Nothing in this world comes easy. If you believe in yourself and stay consistent, you will be successful in your own way. 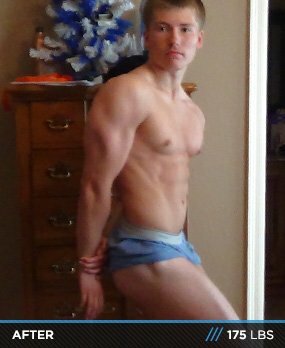 Bodybuilding.com has been a lifesaver when it comes to unbeatable cheap prices. I buy most of my supplements and clothing from here and give a 10-out-of-10 satisfactory rating. Shipping is very quick and cheap. If you ever want to stack up on supplements or awesome gear for a great price, shop at Bodybuilding.com.